Recently, a new friend admitted to me that she has struggled with an eating disorder for many years. As we shared pieces of our stories, she asked a question that launched a mini-sermon in me. Don’t worry, I’m preaching to myself really! But as I clicked “send”, I realized just how much of my response encapsulated all that I’m learning about my eating disorder and recovery in the process of prayer and writing. I want to share my letter with you. You asked about the “why”. Funny, I have thought about that a lot lately as I penned my book and prayed and relived all those years of my own eating disorder. And yes, I’ve come to a conclusion. My sisters grew up in the same household and under the same parents that I did, in the same communities. Personally, I don’t have a history of abuse to blame my issues on. I have a fairly perfectionistic father (toward himself more than toward anyone else) and at time I believed he loved my sister, Jennifer, more than me. And, Jennifer was incredibly talented and smart so I was jealous of her for years. But really? I don’t have a good reason. The more that I’ve prayed about it, I think the common treatment modality, “figure out the root and fix the underlying issues”, does us a huge disservice. I have really, really come to believe that my anorexia was nothing more than addiction and idolatry on my part. No, I’m not blaming myself either. I don’t believe there’s a “why” to be found or blame to be placed, at least not in all situations. It’s really no different than any other sin. It’s the way you and I chose to react to the circumstances and catalysts within a fallen world. Because we believe in Jesus as our Savior, our sin does not banish us from God or cause Him to hate us. So, I’m not saying that as we struggle with an eating disorder God is upset with us. Quite the contrary – and this where I get so excited!! – The pain of living in my sin, the pain of struggling with body image constantly, or starving myself or brutal workouts, the mental anguish of an eating disorder DROVE me to Jesus. It’s His kindness that leads us to repentance. It’s because as I was falling apart, He didn’t turn away, but reached out to me and loved me anyway (while I was still a sinner, Christ died for me). 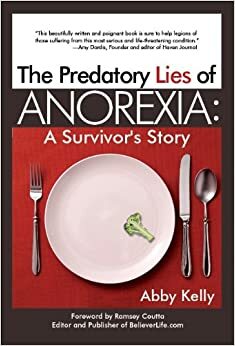 Anorexia was what drove me to my knees before a loving Father. I can honestly say that I would not know Him like I do if I had not struggled. He might have used another issue, but He chose this one for me that I might seek the only one who could save me – not just from anorexia but from sin altogether. Does that make any sense? We are stubborn creatures as humans. We will not naturally admit our need for a savior, so in order to open our eyes, humble our hearts and cause us to seek Him, sometimes God allows us to intimately feel the savagery of a sinful world. It is then that we know how much we need Him. I’m just figuring all this out. I think you are absolutely right Abby (as usual !). It all makes a lot of sense, and who can argue – it worked for you ! As with any depressive illness, I don’t believe digging around in the past looking at causes is the answer. At the risk of upsetting the “experts” I think it can make things worse. The only way forward is top wipe the past clean away, focus only on the present, and start a totally fresh life, and as we know, only God can do that (and does do that, IF we let him). In my troubled times I learnt that it wasn’t God holding me back or making me feel guilty, resentful and uncomfortable. That is the one to beware of, not God. From my experience too, if we seek God single-mindedly, everything else starts to click into place. Things become better (but with ups and downs). Jesus suffered more than we did (and more than anyone did), knowing what would happen in advance. He spares us that, thank God and we mustn’t waste the opportunities and gifts that have been given to us. You found His unconditional kindness and it’s stunning isn’t it ? I believe God uses our pain for good, but he doesn’t cause it. – Character building is a slow process. Whenever we try to avoid or escape the difficulties in life, we short-circuit the process, delay our growth, and actually end up with a worse kind of pain – the worthless type that accompanies denial and avoidance. – The truth will set us free [as Jesus promised] but it often makes us miserable first. The fear of what we might discover if we honestly faced our character defects keeps us living in the prison of denial. – The first step in spiritual growth is to start changing the way you think. – Hope is as essential to your life as air and water. I agree, my favourite too ! That gave me a very warm feeling when I first saw it, because then I knew what to seek. The other pieces of borrowed wisdom are given for others who have been struggling and are still seeking hope. Hope is there all around us but we don’t always see it. It exists in the present, so there is no point whatsoever trying to look for it in the past or the future. I wasted a lot of time and energy trying to do that.